Home > TECHNIC SUPPORT > What is Drilling Bit Burnt Accident? 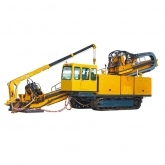 When you use drilling rig to drill water borehole/core work, the drilling fluid is poor and the rock powder is difficult to remove because of the lack of flushing fluid at the bottom of the hole. The drill bit and the hole wall, core and rock powder friction generate high heat, so that the drill bit, the hole wall rock and the core are sintered into one. At this moment, the circulation of the washing fluid is stopped, and the drilling tool can not be rotated and can not be moved. This kind of hole accident is called bit burnt accident. drill accident. Light burned bits make diamond all lost, heavy due to the accident, but also destroy the double core pipe, damage pipe, and even scrapped the drilling hole.